France, 2002, 93 minutes, Colour. Simon Abkarian, Lubna Azabel, Zabou Breitman, Clotilde Courau, Vincent Elbaz, Julie Gayet, Stanislaus Merhar, Denis Podalydes, Malik Zidi. 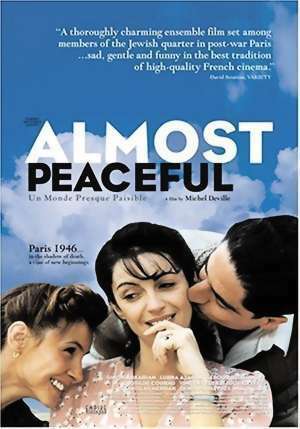 Almost Peaceful was directed by veteran French director Michel Deville. Over forty years he has directed classic dramas of French life. Here he offers a memoir of Jewish people establishing themselves at the end of World War Two, especially in the rag trade and tailoring in Paris. The film is gentle in its presentation of characters. There are memories of the war, atrocities, people being taken to the camps. However, in the aftermath, families reassemble, young man get jobs, trades continue, clientele is built up. The film shows the intimate detail of life in the tailor's shop and focuses on character portraits of those who work there. While there are some bitter memories of anti-Semitism and indications of progress in overturning prejudice in the film, there are still the echoes of what caused World War Two. The film ends optimistically and gently as the families and employees celebrate a picnic. 1. The classic French style of drama? Film tradition? Re-creation of a period, focus on characters and their interactions? 2. 1946, the Jewish quarter, the shops, offices? The interiors? Opening up the film for the picnic and celebration? The musical score? The meaning of the title? 3. The structure of the film: the shop, introducing the various employees, the young men looking for work, the detail of the work, the lives and relationships, the culmination in celebration? 4. The place of Jews in pre-World War Two France? Anti-Semitism? Ghettos? The deportation to the camps and the various family members who were killed there? The role of prejudice? The remnants of prejudice after the war, the changes? 5. Albert and Leah and their shop, their relationship with their children, their love? Albert and his skills, the perfection of his work? The customers and their fidelity? His good relationship with his workers? The children and their going to the camp, the letters, his daughter's art? George, the testing the pain, the reaction? The nice family? 6. The interviews with Morris and Joseph? Morris and his skills, age and experience? Meeting Simone, the memories to age 14 and the flashbacks? His moodiness, talking, taking her out? A future together, her refusal? Simone and her work, the prostitute in the city, the other girls, prostitution taken for granted, her being affirmed by Morris? The contrast with Joseph and his age, his continual clumsiness, everyone pitching in to help, the officer interrogating him, the exhibiting of anti-Semitic prejudice, his ambitions to be a writer, his observing characters? 7. The pregnant wife, her husband and his skills in the shop, friendship with Albert? His continually telling the stories? His love for his family, the wife's pregnancy, the concern of everybody in the shop? 8. The non-Jewish worker, unaware of the Jewish ethos, yet at home working within the group, attracted towards the people there, her learning? 9. Charles, the sadness of his story, the concentration camps, his place in the shop, thinking of migrating? 10. The soap-seller, her later returning to sell the art? Her sharp observations on characters? 11. The skill of the past, the fat lady customer and the possibility of work? 12. The culmination in the picnic, the French art tradition of picnics, people playing together, eating, the general atmosphere of joy and hope for the future?